What Is the Experience of Numbness Like? As a family member of a survivor trying to better understand what your loved one is going through, think about the feeling of a foot or arm falling asleep. Then, imagine experiencing that sensation all the time and how difficult it would be to get through the day with one or more limbs in that condition. Even holding a spoon to stir your morning coffee becomes a huge chore. One positive thing to remember, however, is that survivors have not suffered nerve damage in their appendages; their brains have just forgotten for the time being that the nerves are there or how to use them. This means that, with some work, stroke survivors can potentially overcome these conditions. How do chronic numbness and tingling sensations occur, if they are not due to nerve damage or blood loss to limbs? During a stroke event, blood loss to parts of the brain causes connections between brain cells to become damaged. When connections are lost in the networks of cells that coordinate motor functions, a stroke survivor is left having to re-educate their brain to the use of these body parts. Similarly, a survivor’s hand or arm numbness is caused by the brain having trouble processing information from the sensory receptors in the arm or hand. Although the sensory receptors in a stroke survivor’s hand are intact, the arm or hand feels numb. Recovery of sensation after stroke can be established by re-educating the brain in these pathways. To recover, new connections have to be made to put new, undamaged cells in control of the body part(s) where function has been lost. Similar to the loss of functional movement in a limb after a stroke, numbness and odd sensations occur because a part of the brain in control of that limb has been damaged. When cellular connections in the brain are damaged, the brain will work to compensate for the loss of signal, or even send mixed signals. People experience many different types of sensations during this process, depending on where and how damage has occurred. For example, some may not have lost all sensation, but intermittently experience pain, numbness, tingling, or even the feeling of being wet, due to this misfiring. A stroke survivor’s current stage of recovery will dictate what they should be doing to correct feelings of numbness in different parts of the body. Vigilance is crucial in the early stages of recovery from a stroke event. Often, survivors will be rendered completely immobile after a stroke. When this happens, stroke survivors need to participate in physical and occupational therapy as soon as their condition stabilizes, to regain sensation in the limb and keep the muscles from atrophying. 1. Gather together objects with different textures and place them onto a table. Without looking at the objects, pick them up and feel them. Try to distinguish the differences among textures. Some examples of objects to grab are soft scarves, rough sandpaper, fluffy cotton balls, rough Velcro, and cool silverware. 2. Fill a bowl with uncooked rice and bury different textured objects in it, like marbles, coins, paper clips, and cotton balls. Reach into the bowl and try to find the objects without looking. Identify them by touch. 3. Electrical stimulation has been found to be effective in facilitating improved sensation after stroke. Tools like the SaeboStim Micro use a low-level electrical impulse to help improve sensory function. 4. 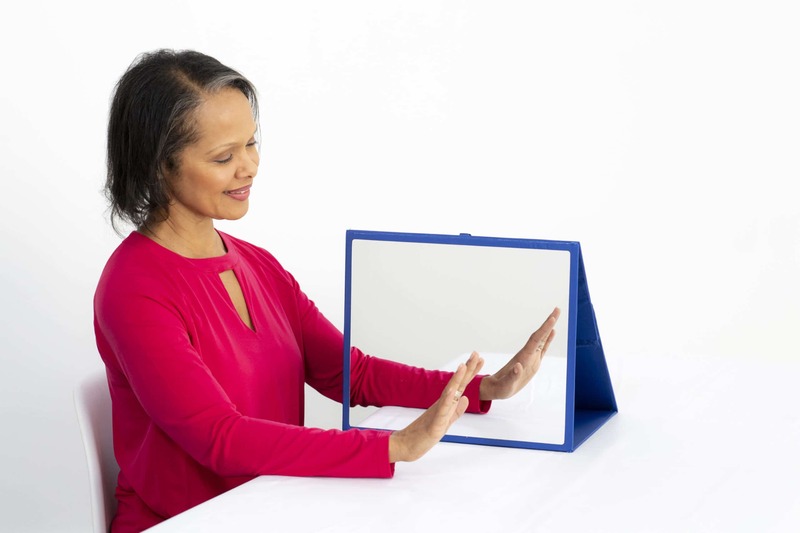 Another rehabilitation technique that can possibly restore sensation is mirror box therapy. In mirror box therapy exercises, the patient places a mirror in front of their affected limb. They then engage in repetitive bimanual, symmetrical movement practice, in which the survivor moves the affected limb while watching the reflection of the unaffected limb moving..
5. If an individual has difficulty with thermal sensation, contrasting temperatures may help. Soak a cloth in cold water and soak another cloth in hot (but not scalding) water. Place the cold cloth on the arm and try to feel that sensation. After 30 seconds, switch out the cold cloth for the warm cloth. Try to feel the difference in temperature. Ask the stroke survivor to close their eyes and have someone to place one cloth on an arm so the survivor can try to determine if it’s hot or cold. Repeat this exercise back and forth alternating between hot and cold. Saebo offers stroke survivors many innovative and affordable tools to aid in their recovery of sensation as well as movement. At Saebo, we’re passionate about making sure you find everything you need to achieve your rehabilitation goals. Here at Saebo, we are committed to stroke support and recovery for all survivors and their families. Saebo offers a wide range of products that combine cutting-edge technology with evidence-based rehabilitation techniques. Our offerings and network of Saebo-trained therapists can help you or a loved one to obtain all the necessary tools to maximize stroke recovery.